Stand out for your style. 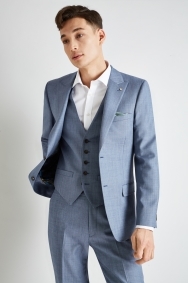 When you’re out to impress, this suit will be your best friend. 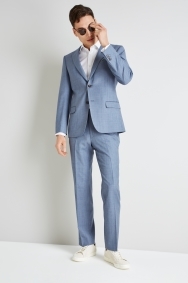 Its light blue colour will stand out to make sure eyes land on you, and the tailoring will define your frame for a sharp look. 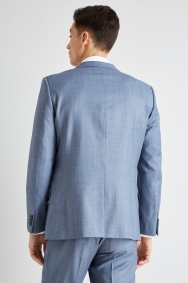 Expect the jacket to cinch slightly at the waist. 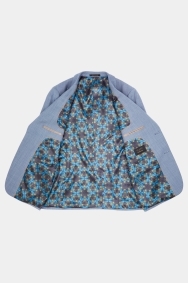 Textured and with peak lapels, it has on-trend style, and as a Ted Baker, you’ll have a playfully patterned lining too. Find the right balance between sharp and relaxed by wearing the full 3-piece with an open-necked shirt and smart white or tan sneakers. 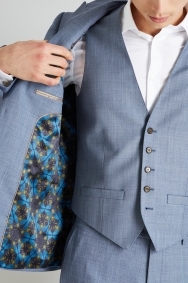 A lapel pin and pocket square will keep you looking smart. Great price, delivery and tracking. Awesome suit. Quality comes at a price, however I have to admit this suit looks quality, feels quality and fits great. Ted B' sizing is a law unto its own. Just try on your normal size jack then go up a size to three, to find the perfect fit.